Will Hutchins on cowboy music and the Northfield, MN, Defeat of Jesse James Days. My wife Babs loves cowboy music. She wants to be a cowboy’s sweetheart. Me? I’m an old cowhand. One of America’s great gifts to the world is our music. I kinda like “Ridin’ Down the Canyon”. Heh, heh—Ol’ Gene Autry slickered Smiley Burnette outta half the profits. Babs hankers dancin’ to “The Cowboy Polka”. Me? I sorta cotton to “Cherokee Maiden”. Told Johnny Western we ‘preciate his “Ballad of Paladin” but find it a mite slow for friskin’. Johnny gave me a semi-sneer and allowed as how his hacienda gets hot ‘n hoppin’ when a royalty check comes rollin’ in. For pure listenin’ pleasure how ‘bout “Home on the Range”? When Bing Crosby sustains “Hommmmme” over a passel o’ heart beats, why pard, can’t you fairly smell the prairie? Hear the cattle? Feel the longin’, the lonesome? Kathryn Crosby got my drift coupla years ago at the “Friends of Old-Time Radio” in Newark. She told me Bing was asked to sing “Home on the Range” at Will Rogers’ funeral back in ‘35. Bing figured he was too sorrowful to do it justice. Will’s widow, Betty, told Bing Will’s spirit would guide him through. And so it came to pass. One bygone September Babs and I followed the nostalgia trail to Northfield, MN, for the annual Defeat of Jesse James Days. When I was young and impressionable Tyrone Power was Jesse James, Henry Fonda was Frank James. Ever see “Return of Frank James”? Directed by Fritz Lang, a German. Beautiful three-strip Technicolor, Gene Tierney’s beautiful blue eyes. Director Lang in boots, jodhpurs and beret shouted “Action!” Dust and gunsmoke clouded his monocle. Frank James (Fonda) is on the trail of his brother’s killer, wounded Bob Ford (John Carradine), who lurches for his life into the town livery stable. You can’t run away from your fate. Frank James follows, holding his gun down by his side. James is relaxed, alert, aware—an avenging spirit, quietly seeking out the dirty little coward who shot Mr. Howard. He finds him—a tad tardy—dead. James holsters his gun and returns to the clean, clear air, his eyes still searching, searching—for lovely Gene Tierney, no doubt. But I digress. The newspaper headline read “Hollywood Cowboys Come to Northfield.” Sure ‘nuff. There we were. Jan Merlin, Ben Cooper, Johnny Western, Ol’ Sweet Toes and Gregg Palmer, along with our ladies, Barbara, Pamela, Jo and Babs. Gregg told me, “When you write about me, and you will, remember Gregg is spelled with two G’s.” Huh! You coulda fooled me. I count three G’s. He currently sports a gargantuan set o’ whiskers. Oh, oh! Here comes Gregg lookin’ mighty weird. What’s up? A-ha! Just as I feared. Two ducks and a hen, three geese and a wren all made their nest in his beard. 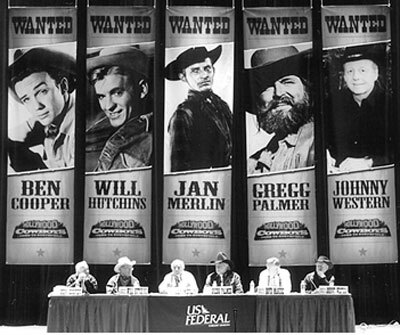 Our sponsor, U.S. Federal Credit Union, treated us like stars on location in a big budget western. Why, we had to have our gift basket shipped home. Besides the usual suspected goodies they tossed in a blanket and two umbrellas, and it didn’t even rain! Weather was well nigh perfect, just like our visit. Ever been to Minnesota? The folks up thataway must be what God had in mind when He created Heaven and earth. Wonderful northern hospitality. First night we were treated to one of the great Italian dinners of my lifetime. Certainly the funniest. You know how it is, a giggle o’ crazy cowboys sittin’ around a huge table tellin’ lies. Strictly ‘Can you top this?’ In the middle of the lazy susan rested a bust of the Pope. When His Holiness spun around and faced me, I felt plum guilty. On our way out I thought I detected a slight quaver in Gregg’s voice, a hint of a tear. “Yes,” he said, “Whenever I go to an Italian restaurant I remember World War II and the Italian family that hid me for four months.” “Gosh! Where was that?” I asked. “San Francisco,” he replied. Of course, the Mall of America beckoned. It’s a shopper’s Disneyland. Babs experienced Gran Mall seizure. She shopped till I dropped. Next day, a drive out to Northfield Middle School for two sessions of symposiumin’, schmoozin’, sellin’, and signin’. I told the folks in the vast auditorium if my high school had been this sensational, I would have attended every day. We sat on the stage at a long table, 15 foot high banners depicting our likenesses hung behind us (below). When I get mine via UPS I’m hanging it from a tree in our front yard. Pays to advertise. My boss Boyd Magers was our genial moderator. His charming wife Donna sat in the audience and laughed and clapped on cue. After Q and A, Ben Cooper amused, astounded, confused and confounded us all with an exhibition of his fast-draw prowess. Ben’s one of the few actors alive who played Jesse James in a flick. Remember him in “The Woman They Almost Lynched”? 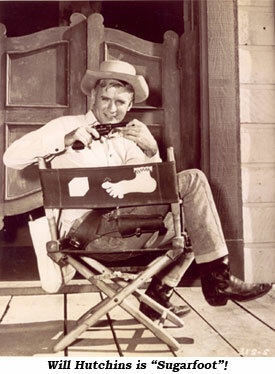 Jan Merlin told the painfully funny story of his first day working in a western. The director was patient and understanding, the wranglers were helpful, the hoss was waiting for the AD to call lunch! After a series of humiliating bolluxes Jan felt down deep this must be the take! He shot his foe with dispatch, smartly sprinted toward said hoss for a fast mount-and-ride-off—said hoss casually looked over his shoulder at the galumping Jan and proceeded galloping off down the street, Jan in hot pursuit. Gregg recited John Mitchum’s “America, Why I Love Her” ala the Duke—Gregg, you made Babs cry. Came the big day. We were blessed with front row seats on the main street for a re-enactment of that famous seven minutes on September 7, 1876, when the James-Younger gang flubbed the dub and utterly failed to wrest even a dime from the First National Bank of Northfield thanks to the brave citizenry, a sharp-shooter or two among their ranks. ‘Course, sure didn’t help the gang’s cause none when they rode up drunk. The performers put on a rip-snorter of a show. I wish I’d had a part. I coulda been crossin’ the street when all the action started. I think I’d make a fine professional street crosser in westerns. Watch out for horses and wagons, Hutch! Oh, and mind where you step.